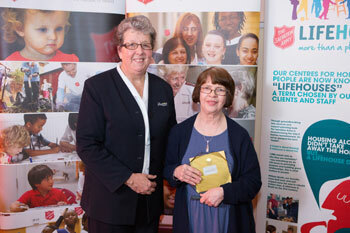 A groundbreaking community hub finding new ways to help homeless people, and a lady who dedicates her spare time to work with elderly people and children in Cardiff are among the individuals and centres recognised by The Salvation Army at its annual social services awards ceremony held this week (Wednesday 5 March 2014). The Salvation Army’s Social Services Awards, held in The Hayes Centre in Swanwick, Derbyshire, recognises those who have made an exceptional contribution to the church and charity’s work helping vulnerable people as the largest provider of social care in the UK after the government. With 18 older people’s homes, more than 80 Lifehouses to support homeless people, and over 800 churches and community centres offering a range of services, The Salvation Army is on hand to help people across the UK and the Republic of Ireland. Among the award winners is unsung hero Mair Chubb (right, pictured with Head of Community Services Captain Elizabeth Hayward), from Cardiff, who dedicates hours of her time to community work at the Cardiff Cathays Church (corps), helping to clean the houses of elderly people in the city, stepping in to help at a moment’s notice at the church’s children’s nursery, and setting up summer camps to give children in poverty a holiday. The Redbridge Cold Weather Centre and Recycles Social Enterprise are projects offering year-long support for homeless people in Ilford in East London. Ilford Church (Corps) has been working with homeless people in their community for many years but with more people now needing support the team there has restructured its approach. By winter 2011 the church, under the leadership of Lts John and Naomi Clifton, became involved with an ecumenical winter night shelter. This has expanded over the past couple of years and they, with the other churches accommodate nearly 100 people during the coldest months of the year. John Clifton said: "It is a real privilege to be recognised for the work we do in Ilford. We are really seeing a difference in the area. Social action is so important to what we do and I'd like to thank everyone who volunteers at the centre." The awards are split into four categories – homelessness services, community services, older people’s services and services to people with learning disabilities. They are judged by independent panels, with hundreds of Salvation Army social centres and community churches along with thousands of staff in the UK and Republic of Ireland eligible for nomination by employees, service users, residents and local community groups.